Noted Boston artist Eleanor Rubin’s Transformations: Sound into Image, a visual response, with woodcuts and watercolors, to the music of Hikari Oe, a composer with autism, opens the Spring season at Kantar Fine Arts, a Newton gallery exhibiting contemporary work by New England and international artists, on Saturday, March 29, 2003. The artist reception will be on Sunday, March 30, 2-5pm, at the gallery. The show runs through April 27, 2003. 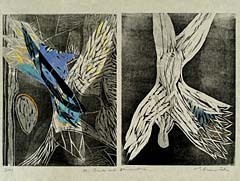 Ms. Rubin presents images that combine woodcut and watercolor techniques to create a series of rhythmic variations inspired by the music of Hikari Oe, for whom music is the primary means of emotional expression. 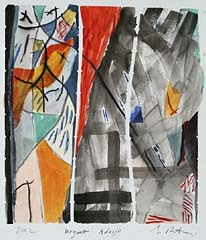 Multi-layered pairs of lyrical images on Japanese Mulberry paper, some in black and white tonalities, others with subtly muted colors, some with collaged shapes or stenciled forms, and others with delicate linear images, call to mind the harmonies, pedal points, overarching melodies and chordal accompaniment of Oe’s music. Ms. Rubin has achieved recognition as a printmaker and watercolorist in New England and nationally for over thirty years. She has exhibited widely in many prestigious venues, including the Boston Public Library, Montserrat College of Art, University of New Hampshire, and the Cambridge Art Association. 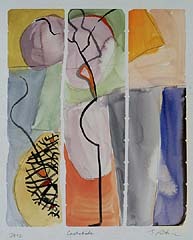 Her work is in many permanent collections, including the Museum of Fine Arts, Boston, the Boston Public Library, and the Institute for Research on Women and Gender, in Ann Arbor, Michigan. She has lectured extensively about printmaking and drawing, and has been critically acclaimed in many reviews and publications, most recently in Art New England (2000), the Journal of Geriatric Psychiatry and The Boston Globe (2000). Ms. Rubin is a graduate of Brandeis University, and has a Masters in Education from Harvard University. Deciding upon art as her life’s work, she studied in Chicago, with Paul Wieghardt, who was, himself, a student of Paul Klee at the Bauhaus in 1923, and a painter who had a lasting relationship with Klee. 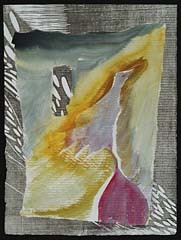 Ms. Rubin also studied with Marian Parry, watercolorist, at the Radcliffe Seminars.